All the Basketball fanatics should get ready to experience the thunder and sparks of the ultimate basketball experience as the most thunderous team "Oklahoma City Thunder" is ready to take you to the land of unstoppable excitement and thrill. Those of you who think that this is some new basketball franchise are totally wrong as the name may sound new, but the team is your good old favorite Seattle Super Sonics that has been playing many super duper hit games form the past many years. Now the Sonics are venture in the game with a new name and new passion and energy. So while you make sure to check out these warriors in a near basketball arena, first get acquainted with the Oklahoma City Thunder. Oklahoma City Thunder is new name and identity of the Seattle Supersonics. The Thunder is located in Oklahoma City and they play in the NBA"s Western Conference as part of the Northwest Division. Their home ground is the spacious 586,000 square foot arena Ford Center that has a capacity for more than nineteen thousand spectators. The team colors are blue, orange-red and yellow and they have a large number of faithful supporters including the enchanting cheerleaders called Thunder Girls. The Oklahoma City Thunder is here for around forty years now, but now they have a new identity and a new appeal that is more intoxicating than ever. The Oklahoma City Thunder moved from Seattle after the end of the 2007-08 NBA season. Before that they played as Seattle Supersonics and won one NBA Championship in 1979 besides many playoff appearances and other power-packed performances. Let us take a brief look on their journey from Seattle Supersonics to Oklahoma City Thunder. It was the 1967/68 season when NBA landed in the Pacific Northwest and the Seattle Supersonics joined the league as one of two new expansion teams. The name Seattle Supersonics represents the area's aerospace industry specifically the Boeing Supersonic Transport [SST] manufactured in Seattle. The team started its journey in the field with Coach Al Bianchi and players Tom Meschery, Walt Hazzard, Bob Weiss and Rod Thorn besides many others. The team played its first game on October 13, 1967 and soon crated a handsome fan base for itself. The 1974/75 season was a significant one for this team as they closed the year with a seven game winning streak to make it to the playoffs for the first time in franchise history with a record of 43-39. Towards the end of this decade, they proved their supremacy in the world of Basketball by naming a NBA championship to its name. They defeated the Washington Bullets and closed the series with a 97-93 win to claim their first ever NBA Championship. Dennis Johnson was named Finals MVP that year and the team continued its good performances in the upcoming years. The Oklahoma City Thunder has initially made its mark as Seattle Supersonics. They have made 22 playoff appearances with an impressive eight consecutive in 1990"s, from 1991 to 1998. Besides winning one NBA final, the team has also made it to the finals in 1978 and 1996. It has also won six Conference finals ad the same number of Division Champions. The team has played in different arenas like Seattle Center Coliseum, Kingdome, Seattle Center Coliseum, Tacoma Dome and Key Arena before moving on to Ford Center. Till now, the team has been coached by nineteen different coaches including the Hall Of Famer Lenny Wilkens. The Oklahoma City Thunder is a home to many great players. It has been a team of Hall of Famers like Patrick Ewing, David Thompson and Lenny Wilkens. Dale Ellis won NBA Most Improved Player in 1987 while Gary Payton was named NBA Def. Player of the Year in1996. The recent one to keep the tradition of his team alive is Kevin Durant who was named NBA Rookie of the Year in 2008. The Oklahoma City Thunder has played many nail-biting games with the likes of Portland Trail Blazers, Utah Jazz, Minnesota Timberwolves and Denver Nuggets, all considered its biggest rivalries. The Oklahoma City Thunder has gone through many ups and downs during its history. The decade of 1990"s was the most successful one for them with 1995/96 regarded as their best season with an impressive 64-18 record. However, the team hugely falters in recent times and witnessed its worst season in 2007/08. The team moved from Seattle after this season. They played their last game on April 16, 2008 and then moved to Oklahoma City. The new identity came into being when a group of OKC-based investors purchased the Seattle Supersonics from Starbucks mogul Howard Schultz in 2007. The team was then relocated to Oklahoma City and now they are all here with a totally new spirit and new passion that will surely drive them to fight to the fullest of their ability and win the game. Today, the Oklahoma City Thunder is all out with a powerful team and good support from their fans. Indeed, their fan base is much bigger now as it included the old Seattle Suoersonics supporters along with the new crazy fans for this franchise of Oklahoma City. The Thunder has signed an exclusive radio agreement with Citadel Broadcasting and their games are broadcast on "The Sports Animal" while "Fox Sports Oklahoma" is their official television partners. What is even more exciting is the inclusion of veteran play-by-play announcer Brian Davis and former NBA player Grant Long in the television broadcast team. The Oklahoma City Thunder is predicted to be a team to watch out for in the upcoming season. They are talented and spirited and they have a healthy mix off past experiences and new strength that will surely make them a thunderous force on the gaming arena. All this combines with the loud cheers from the Thunder Girls and thousands of their fans, the Oklahoma City Thunder is more powerful today than they ever were. So check out this new basketball phenomenon in its latest game as Oklahoma City Thunder will surely make a grand opening statement and will create a lot of thrill, excitement and thunder. The mind blowing Oklahoma City Thunder are a renowned pro basketball franchise that has awed Americans for many years since its formation. This superb team plays within the Western Conference's Northwest Division, the conference itself being part of the NBA. This pro American basketball outfit was founded way back in 1967 and has since then amazed thousands live with its game play and its numerous wins. In 1967, this team was formed as the Seattle SuperSonics and played in the city of Seattle for most of its life until 2008 when the team moved to Oklahoma City. This team's home arena is Chesapeake Energy Arena, located in Oklahoma City within the state of Oklahoma. The official Oklahoma City Thunder colors are light blue, gold, white, navy and orange red. This team is owned by Professional Basketball Club and has as its head coach Scott Brooks. The Tulsa 66ers are a D-League team affiliated with the Oklahoma City Thunder pro basketball franchise. Over the course of this pro basketball franchise's career, it has won many titles. This awesome team has won one superb NBA Championship, equal to football's Super Bowl, as well as three different Conference titles and seven Division titles. Oklahoma City Thunder has also distinguished itself as the only major sports team from within the four major American sports league to call Oklahoma City home. In terms of playoffs, Oklahoma City Thunder has qualified for them a record twenty two times, winning six division titles on the way and bagging the coveted NBA Championship in 1979. Thus, this is truly a team that has distinguished itself not only in its division and its conference but also nationally in American pro basketball making a team to be watched live through Oklahoma City Thunder Tickets. The average Oklahoma City Thunder tickets price will cost you between $96 and $253, if you are looking for the cheapest seats then catch the event being held at the BOK Center, Tulsa on 08/10/2019. The average ticket will cost you the highest on 25/04/2019 at the Chesapeake Energy Arena, Oklahoma City. Minimum get in price is for Oklahoma City Thunder tickets is $19 for the event being held at the Chesapeake Energy Arena, Oklahoma City on 25/04/2019 , there are some venues that have a much higher get in price, for instance the cheapest seats at the BOK Center, Tulsa on 08/10/2019 will set you back $27. I just purchased cavaliers vs. okc thunder tickets but now found some better seats. can i exchange tickets with better ones? Tickets once purchased can not be exchanged unless specifically stated in the listed ticket description. Please double check your Cleveland Cavaliers Vs Oklahoma City Thunder Tickets before submitting the order. Are the prices for adult and child cheap tickets for the oklahoma thunder game different? Oklahoma City Thunder Tickets necessity for children's admission depends on the specific venue rules and regulations. There is not a set age, which would require the purchase of a ticket or not. If buying a ticket for a child, please contact the venue before placing an order. I still haven't received any confirmation about my cheap tickets to okc thunder purchase. What is wrong? We are extremely sorry about that. Please call us on our toll free number with complete order details and we will look into why the confirmation e-mail about your purchase of Oklahoma City Thunder Tickets is still pending. 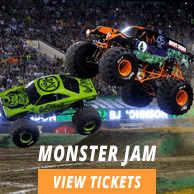 I have chanced upon your site while searching for jazz vs oklahoma tickets. Where do i find tickets, prices and seats? It is your day if you have come to us! Kindly browse through our inventory where the most comprehensive selections of Utah Jazz Vs Oklahoma City Thunder tickets with their prices and seating map are given. Will I have to pay the courier company anything for the delivery of my utah vs okc tickets? No, the price you paid to book Utah Jazz Vs Oklahoma City Thunder Tickets covers all expenses so you will not have to pay the courier company anything for the delivery of your tickets. Can you tell me a place to buy ok thunder cheap tickets? You have to come to the right place to buy Oklahoma City Thunder Tickets at cheap prices so you don't need to look elsewhere. Look through our page for details and order from there. I need the oklahoma city thunder girls tickets. Would I find them here? Of course you will! Ticket Luck always has an inventory full of all the hottest events! Browse our collection of Oklahoma City Thunder tickets now, and grab your pick today! How can I buy okc thunder finals tickets cheap from your website? The process is simple. You just have to select the Oklahoma City Thunder Tickets you want; fill the form mentioned there with your details and your order will be placed. Will I be able to get cheapest tickets to the thunder game in okc on the day of the event? The Oklahoma City Thunder Tickets are being sold on first come first serve basis so they will only be available on the day of the game if they are not sold-out by then. What is the price range for cheap tickets for okc thunder event? For complete details about Oklahoma City Thunder Tickets and their prices, please log on to our website or call us on our toll free number for further assistance. Is thunder tickets ticketluck the best way to buy them? Yes, the prices we are offering for the Oklahoma City Thunder Tickets are unmatched. Please visit the pricing section of our website and book your tickets now. How long will it take before I receive my cheap tickets for oklahoma city thunder? Your Oklahoma City Thunder Tickets will be delivered to you within the specified time. If there is any delay then you can easily contact our sales reps.
Can I get okc thunder cheap tickets seats of my own choice? If you want to get Oklahoma City Thunder Tickets seats of your own choice its best you contact our sales representative. They will guide you better. When will I get my oklahoma thunder tickets cheap delivered to me? Your Oklahoma City Thunder Tickets will be delivered to the address specified by you as per the time conveyed when you bought your tickets. Can i get thunder basketball season tickets 2019 seats of my own choice? If you want to get Oklahoma City Thunder Tickets seats of your own choice its best you contact our sales reps. They will guide you better. I want to get discounted thunders tickets. Can you help me with that ? Yes, log on to our website and get the Oklahoma City Thunder tickets. You will get the discount code at the time of purchase of tickets ! I want to buy cheap oklahoma thunder tickets. Do you have them? Yes, we do have Oklahoma City Thunder Tickets available at cheap prices. Look through our page for details and you can order from there. Can you guide me about where I can buy okc thunder cheapest ticket? You can buy the Oklahoma City Thunder Tickets at very cheap prices from us. Please visit the price section on our website for details. How do I avail extra discounts on oklahoma thunder cheap tickets? Extra discounts on Oklahoma City Thunder Tickets can be obtained by entering the promo coupon code when buying the tickets from us. Where can I find cheap tickets to okc thunder game at the best prices? You, can buy Oklahoma City Thunder Tickets from us at the cheapest possible prices that you will not find anywhere else. How can I buy luck tickets to oklahoma thunder game? You can buy Oklahoma City Thunder Tickets from us directly from our homepage wile enjoying the comforts of your home. You will get all the information you need regarding Oklahoma City Thunder Tickets on our toll free number. How many cheap thunder tickets can be ordered? You can order as many Oklahoma City Thunder Tickets from our website as you require, we have no limits. Do oklahoma city thunder have any games this season? You can get all the information on Oklahoma City Thunder by visiting their section on TicketLuck. Where can I get good but cheap oklahoma city thunder tickets from? TicketLuck is the ultimate source to get your great but cheap Oklahoma City Thunder tickets from. Do you have oklahoma city thunder cheap tickets? Oklahoma City Thunder Tickets are up for grabs with us so click on them before someone else does. Hello, I found my okc thunder tickets, how do I buy? Please click the purchase button next to the OKC Thunder tickets you intend to buy. Thank You. I need discount oklahoma city thunder tickets? Get the tickets from www.ticketluck.com and dont forget to punch in the discount code. Where can I get a look at the oklahoma city thunder tickets inventory? Oklahoma City Thunder Tickets inventory is right here with us so check it out! Could you please refer to me any site, which has got thunder tickets? Please visit Ticketluck and order your Oklahoma City Thunder tickets now.